Maduqa is a fledgling web startup in Nairobi. Their goal: make it simple, fast and easy for any Kenyan business owner to get their own store online in just a few minutes. Surprisingly, there’s nothing else out there quite like this (that I’ve seen), so it’s an excellent example of local entrepreneurs taking ideas from the global stage and localizing them to Kenyan needs. It’s a simple website, with a focus on two things. First, it’s online shops for ordinary businessmen, whether you operate out of your house, a duka or a business frontage. Second, it’s a classifieds listings site. There’s a lot of draw in figuring out how to crack the Kenya classifieds market, and the web is littered with a dozen mediocre attempts at this from Craigslist to the Nation Media Group, much less the everyday sites that others throw up. In this case, I think it’s a diversion from what should be the focus: online shops. We’re starting to see more Kenyans paying attention to the web-side of their business. For most, that just means that they know the internet is out there and might be valuable in attracting customers. Those are your medium and upper-class businesses. The upper-class ones will go out and design their own websites, Maduqa isn’t for them. Instead, Maduqa is for the businessman doesn’t have any marketing budget to speak of, she might be a hairdresser or a person running their business at night from their home. They don’t have the time, energy or know-how to setup a store on their own, but they could set up a Maduqa site. It’s free too, so the cost of failure is low. Your worst case scenario is that you are finally searchable by name online. There is a small team of individuals who are going around and trying to sign up new businesses into the site. It’s analog, and not nearly as efficient as if you were running a pure viral or digital marketing campaign, but then their target end-user probably wouldn’t see those anyway. Any other type of marketing is even more expensive and untenable for this bootstrapping startup. So, let’s say they have three guys walking around town trying and they each aim for 15 new Maduqa shops online each day, that’s 45 shops per day total. Not bad, especially if you extrapolate that out to 20 working days per month with a total of 900 online stores per month added to the website. In three months they would have 2700 online shops. Now we’re talking some serious mass. Maybe even enough to get on the radars of consumers, especially as all the marketing for the store websites will be done by the store owners themselves, as they tell everyone about their new website. I met up with Kachwanya, one of the duo behind the site and walked through the site with him, discussing both the pros and cons of this type of service and the site itself. Here is a quick rundown of what I liked/didn’t like, keeping in mind that it’s an early-stage website. Anyone can setup an online shop now. Conceptually, this is very easy to grasp. There is a team of Maduqa reps going around and signing up new business owners. The potential to take over the online stores market in a country. 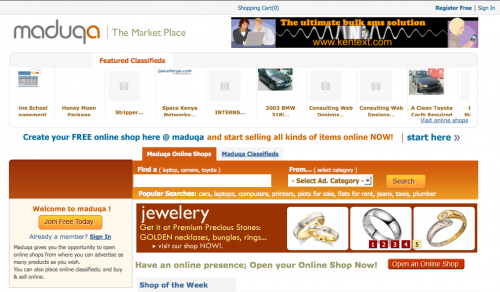 Scrap the classifieds, stick to one thing: online shops. Let’s see PesaPal (or its equivalent) instituted on this site. I can see no better win-win situation for Maduqa, the end users or PesaPal than this kind of partnership. Parts of the site look nice, but it also feels a little cluttered, some design and usability tweaks would help. Get more feet on the street, sign up more businesses and get up to critical mass even faster. I’m impressed by this simple and workable concept. They have the technical acumen to do it, there is no doubting that. Will they have the business acumen to balance? Time will tell if they will pull this off, but I’m optimistic that they can.